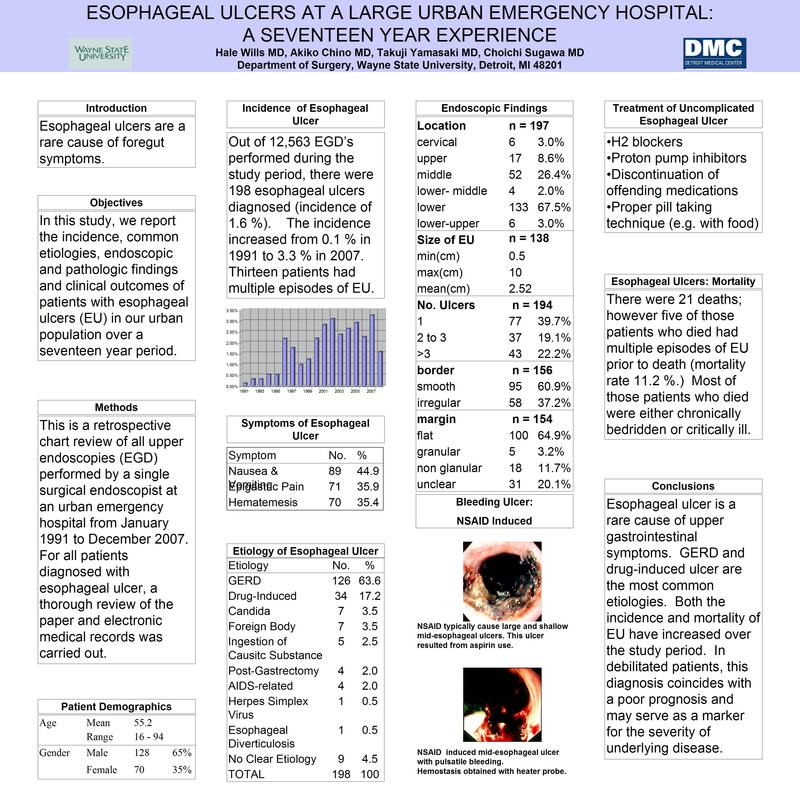 OBJECTIVE: In this study, we report the incidence, common etiologies, endoscopic and pathologic findings and clinical outcomes of patients with esophageal ulcers (EU) in our urban population over a seventeen year period. METHODS: This is a retrospective chart review of all upper endoscopies (EGD) performed by a single surgical endoscopist at an urban emergency hospital from January 1991 to December 2007. For all patients diagnosed with esophageal ulcer, a thorough review of the paper and electronic medical records was carried out. RESULTS: Out of 12,563 EGD’s performed during the study period, there were 198 esophageal ulcers diagnosed (incidence of 1.6 %). The incidence increased from 0.1 % in 1991 to 3.3 % in 2007. The most common etiology was gastroesophageal reflux disease (GERD, 126 cases), followed by medications (drug-induced, 34 cases.) Other causes included candida (7 cases), foreign body (7), ingestion of a caustic substance (5), post-gastrectomy (4), AIDS-related (4), herpes simplex virus (1) and esophageal diverticulosis (1) while nine had no clear etiology. The most common presenting complaints were nausea and vomiting, epigastric pain, and hematemesis (89, 71, and 70 cases, respectively). Thirteen patients had multiple episodes of EU. There were 21 deaths; however five of those patients who died had multiple episodes of EU prior to death (mortality rate 11.2 %.) Most of those patients who died were either chronically bedridden or critically ill. CONCLUSIONS: Esophageal ulcer is a rare cause of upper gastrointestinal symptoms. GERD and drug-induced ulcer are the most common etiologies. Both the incidence and mortality of EU have increased over the study period. In debilitated patients, this diagnosis coincides with a poor prognosis and may serve as a marker for the severity of underlying disease.